True and beautiful natural gemstones owe their development to wonderful natural causes of the world, of which there are many varieties; mineral origin found in rocks, in gem gravels from these rocks, or organic gems from plants and animals – all with no intervention or production from man. For natural mineral gemstones to occur, a combination of temperature, pressure, oxygen, chemical elements and time are all needed for their formation. Different environments and processes produce a variety of gemstones with varying chemical structures and crystal structures which produce such diverse attributes of hardness, colours and optical qualities. Organic gems have been adored for hundreds of years and are from living things such as plants and animals. Amber is an organic gem of hardened and fossilised tree resin from pine trees, typically from hundreds of years ago. 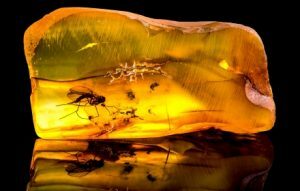 Amber can have inclusions such as insects that were trapped inside the resin as it was forming – such inclusions of insects can increase the amber’s worth. Pearls are another divine and organic gem from the produce of molluscs, either fresh water or salt-water. Starting with a foreign body entering and becoming an irritatant to the mollusc, this causes it to protect itself by producing a layer of nacre to coat the foreign body – this ultimately produces the pearl. Other organic gems include coral, shells, ivory, jet and even tortoise shell. Mineral gemstones are formed from rocks, of which there are three main types: Igneous, Sedimentary and Metamorphic rocks. These processes form the rock cycle as they are all in a constant state of change, as well as interlinking with sub cycles and cross interactions. The varying types of rocks have their own processes which can change a rock or gemstone’s chemical and physical properties. The earth has several layers that were formed 4.5 billion years ago; the crust, which makes up 1% of the Earth’s volume, is from 3 miles to 25 miles deep, the mantle is said to make up 80% of the earth’s volume, and finally the core which has a solid inner and liquid outer layer – all of these layers and processes produce the stunning gemstones that are found. Igneous rocks – the solidification of magma, the magma rises through the cracks of the earth’s crust and dependent on whether or not the magma reaches the surface, ultimately leads to intrusive or extrusive igneous rocks. Intrusive igneous rocks are formed through the cracks of the earth’s crust or volcanic pipes which are able to cool slowly under the earth’s surface giving, with time and perfect environmental factors allow the magma to form large crystals. If the magma erupts onto the earth’s surface it is then deemed as lava and depending on the rate of cooling, the extrusive rocks can produce medium to very small crystals. Igneous rock gemstones include amethyst, citrine, emeralds, aquamarine, garnets, moonstone, diamond, topaz and zircon. 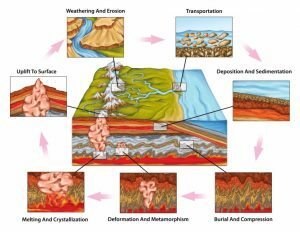 Sedimentary rocks – the consolidation of layered sediments, with igneous rocks on the earths surface and due to factors of erosion and weathering can mean that they are broken down into smaller pieces which are then transported by the wind or water and deposited into pockets. Eventually these pockets are built up into layers through continuous cycles of erosion and deposited on top. Eventually with the layers building over time, pressure begins to build up on the bottom layers causing them to become compact, producing chemical and physical changes, altering its state, and producing new rock formations. An example of a sedimentary rock gemstone would be opal or zircon. Metamorphic rocks – these can be either igneous or sedimentary rocks under tremendous heat and pressure. This happens within the earth’s crust, over time or from direct contact with magma, and can result in the change of the crystal structure. This forms new rocks and minerals, producing new gemstones such as Jade, Turquoise, Ruby, and Sapphire.